It’s the conversation opener that every person of colour has been on receiving end of. The persistent refusal to accept that I’m, as I say I am, Scottish. I bat it off, tell the asker that I’m from my mother’s womb, glare at them, pretend not to hear. But they don’t give up. They ask again, perhaps, I didn’t hear them the first time. I was born in a hospital just south of Loch Lomond. I have a West coast accent and I worked in a kilt shop when I was a student. “Ah, you are from China,” comes the sage reply when I finally capitulate. As if, now that a neat label has been put on my ethnic origin, it makes everything better. That the unknown quality was worrying them too much to just talk to me. And the thing is, if they bothered getting to know me, it would come up. I talk about my mum with her Chinese traditions, my husband cooking Asian food, my terrible Cantonese and my trips to Hong Kong. I always knew we were different. We lived in a commuter town near Glasgow, one of only three Chinese families in the local area. I convinced the kids at primary school that Jackie Chan was my uncle and that I could kung-fu paralyse them with two fingers. I was jealous of their Sunday roasts, going to church and having special spoons just for soup. But guess what? The belligerent questions don’t just come from White-British people. When I first went to university in Edinburgh, other Asian students kept asking me if I was a BBC. I shook my head, having no affiliation with the TV channel, until it was finally explained to me. The Asian international students saw me, and other British-Chinese people, as yellow on the outside, white on the inside. Bananas. I speak Cantonese like a 5 year old and I didn’t know the origins of the Dragon Boat or Harvest Moon festivals. I don’t believe in the healing properties of herbal soup, I have showers in the morning and sometimes, I even wear my shoes indoors! There’s a spectrum within the British-Chinese community. Some are immersed in Chinese culture. Their friends are Chinese, they grew up watching wuxia dramas and singing Canto pop on home karaoke machines. On the opposite end are those who want to fit in with Western friends, who refuse to speak Chinese and reject Asian friendships. But most of us vacillate between the two. I found it difficult to make Chinese friends growing up. Within the already small community, finding people who love fantasy and geekdom was even more difficult. There didn’t seem to be space for reading, writing, crafting, philosophical debates with friends. The likelihood is, if I had stayed in Glasgow, I would have rejected most of my Chinese culture. I moved to Japan because I loved anime and J-pop. But I also moved because I never tired of asking my mother how she had survived in the UK, 17 and illiterate, speaking not a word of English, and only learning how to use a knife and fork on the plane. She just got on with it. And I wanted to do the same thing. To challenge myself to live in a country where I didn’t speak the language. Japan was a culture shock to me in a way it might not be to other gaijin. I had no problem with the daily rice meals, the unidentifiable meats, the chopsticks and noodle slurping. I had a problem with being invisible. Suddenly I went from being the one person of colour at most events, to another anonymous Asian face. My colleagues with their white skin got special treatment, strangers complimenting them, making allowances, whereas all I got was a confused look as I stumbled over Japanese words. There are so many local events in Japan. From the onidaiko devil drumming festival in Sado to the belly button festival in Furano, traditions are still well and truly alive. Hello Kitty is seen in every souvenir shop with a different food or clothing to denote the local area and tourists flock to buy the regional foods as gifts. For this first time, I was not questioning if I was Chinese enough, I was questioning if I was Scottish enough. I didn’t have all the answers. I had to Google some, shrug off the others. And perhaps no-one knows all the answers. Because my experience is Glasgow, and around Glasgow. I couldn’t speak for the islands, the Borders, the east coast. Heck, I couldn’t even speak for the south-side of Glasgow. When I was in Japan, an American colleague said something that stays with me. Her husband was Japanese and they had several children together. She told me that in Japan, they call mixed race children “hafu”, much like we might say they were half-Japanese. No-one was calling her children half of anything. “No,” she said. “My children are doubles.” Both Japanese and American, they have double the language, double the culture, double the joy. And it’s only when I came to accept this dual identity that I stopped asking if I was enough of anything. The culture of the British-Chinese community is divergent from both Chinese and British. It’s not less, or half, it’s simply different. We have different words from Hong Kong Cantonese, different dishes in our restaurants. The big night out is Monday and weddings are often on Tuesdays, because the Chinese takeaways usually closed on Tuesdays. We all remember the worn VHS tape of a badly dubbed anime or drama, making its rounds through various families as the static lines grew with each rewind. We remember clingfilm on the TV remote and plastic on the dining room chairs. Christmas is widely celebrated by my generation but dependent on family, it has been lovingly hewn together like a delicious Frankenstein’s monster with fried rice instead of potatoes or roast pork instead of pigs in blankets. And even all of that is changing as more people get graduate jobs, find work outside of the takeaways, with people who have come from mainland China, Singapore, Malaysia and other countries. 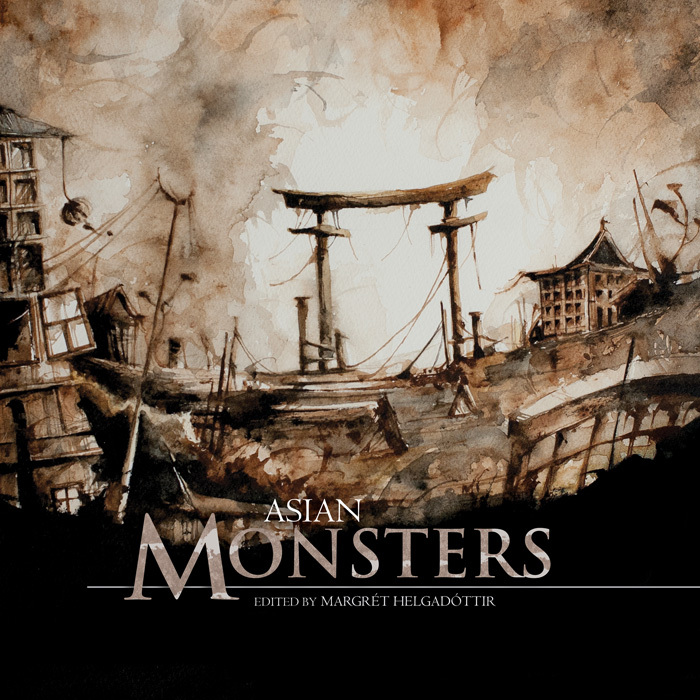 Asian Monsters is a double, a Western-Eastern hybrid that has spawned something that new. And as much as I love folklore and mythology, I’m glad there is this creation, this monster still evolving as we evolve with it. Before December 2012, publishing horror novels—as in printed books that are available in Indonesian bookstores—was the furthest thing from my mind. My long fiction gravitates more toward fantasy and adventure. Then I heard that a certain publisher was going to accept horror novels for publication in 2013. For the record, the publisher is widely known for their romance novels, movie tie-ins, and gorgeous covers. I thought, why not? After all, it’s one of my favorite genres. So, during that December, I wrote a horror novel for the first time. The overall response to the novel seemed quite positive, considering I was an unknown. Since then, I’ve had four more novels published, not all of them of the supernatural bent. Thus, by challenging myself to write something I never had before, I opened a door of opportunity while expanding my writing repertoire. I peeked through another door in 2015, when I dared myself to submit to paid English-language publications. That part of the publishing world had always seemed vast and intimidating to me (it still does). What’s the worst that can happen? I asked myself. Rejections, right? Okay, and maybe a bit of bruised pride. Unlike my novels, my short stories for English-language publications are based on local legends. Because why not use the opportunity to introduce Indonesian legends to a wider audience? Different medium, different purposes. For instance, what if those legendary figures are still alive today? What do they do, and do the events that once changed their lives still affect them? Exploring these themes was a new experience for me, and turned out to be a heap of fun. In short, what got me interested in writing horror novels was an opportunity. Ditto about submitting to English-language publications, since many publications are open to the types of stories I enjoy writing. Walking through these doors has been eye-opening, and I’m ready to search for the next door. 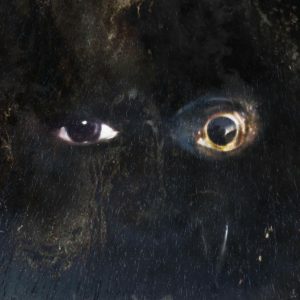 Our folklore monsters, yokai, are the way through which our ancestors tried to explain the aspects of the universe, otherwise unexplained at the time: mostly fear for the unknown. 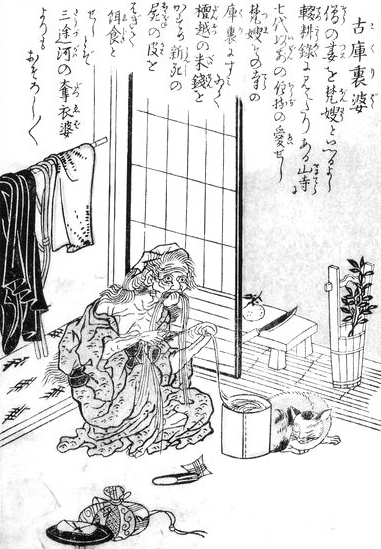 It’s dark, you want to reach the comfort of your home as soon as you can, but you find yourself unable to keep walking–if you feel something is trying to trip you, it might be a monster called sunekosuri, calf-rubber; if you feel as though something large is blocking your path, it might be nurikabe, the wall monster. Ghosts are categorized as yokai, too. People probably tried to explain *what happens* once you’re dead, by creating ghosts. Or perhaps tried to reconcile themselves with the fear for death, by imagining that something goes on after death of their body, even as monster. Now, the main character of my story “Kokuri’s Palace,” Crone Kokuri (kuri means the temple’s kitchen, ko- is a prefix meaning old), I think, falls in this “explaining the unexplained” category, too. In our folklore she is an old woman living in an old temple. She strips corpses of their skins, eats the flesh, weaves stuff with the corpses’ hair. This is, I think, how people tried to see where corpses go after they are buried. By making her find the use for hair, they even explained how the hair lasted longer than the flesh, and what became of it. The part about Kokuri wearing the corpses’ skin is entirely my creation. She is always depicted as a horrifying, grotesque kind of a monster, and I wanted to imagine her finding entertainment, even in her solitude. And I hope she wouldn’t mind my tampering with her nature–after I die, I’ll be burned down to bones, and will have nothing I can offer her. Hurrah! Welcome back to our continent by continent tour of the world of monsters! Discover something new and horrifying in the dark places and we put monsters back where they belong, lurking in the shadows of myth and tradition. So far we have visited Europe and Africa, and the books were accompanied with some fantastic blog posts by participating authors. 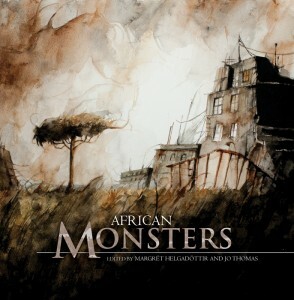 This year we are visiting Asia and exploring monsters from many countries in stories and art. 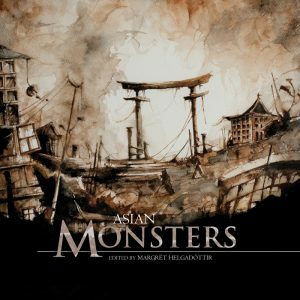 Find Asian Monsters on Amazon.co.uk now! On Monday we begin a series of blog posts from the authors about monsters, both the sort in the book and the sort they deal with in life.